Dental veneers are ultra-thin, custom-made shells of either porcelain or a composite resin material, which are bonded to the front of teeth. Veneers are designed to cover the front surface of teeth in order to change their color, shape, size or length. By masking discolorations, veneers can dramatically brighten a person’s teeth and enhance his or her smile. What is the Difference Between Porcelain and Composite Resin? Composite resin is typically used to conceal chipping or discoloration of the patient’s natural teeth, or where there is minor misalignment. This type of veneer is applied to the tooth first, and then shaped appropriately. It is also removable and reusable, as it is made from a flexible resin material. Porcelain veneers, on the other hand, must be constructed in a lab before being bonded to the teeth. Porcelain veneer treatment entails the removal of a very thin layer of the tooth’s enamel as well as the bonding of a finely sculpted porcelain veneer. This type of material is used when the patient has severe discoloration, malformation, or misalignment. Overall, porcelain veneers have proven to resist stains better than composite resin veneers, and are commonly considered to appear more authentic (porcelain veneers mimic the light-reflecting properties of a patient’s natural teeth). In addition, this material has an extreme resistance to staining and chipping as compared to resin veneers. 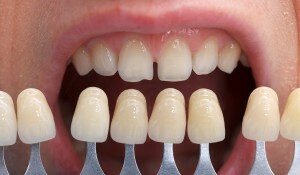 Composite veneers are less expensive than porcelain veneers. To learn which type of dental veneer is best for you, be sure to share your concerns with Dr. Naik at his Moreno Valley dental office. Both procedures can provide aesthetically pleasing results. Composite resin veneers and porcelain veneers differ in longevity, but both are long-lasting; composite resin veneers typically last between seven and ten years, while porcelain veneers can last for more than 15 years. They will eventually need to be replaced. Veneers can effectively fix a variety of problems, including teeth that are: discolored, worn down, chipped or broken, misaligned, uneven, or irregularly shaped, and widely spaced (veneers will close the gap). Please read the information above regarding the different types veneer materials – composite resin and porcelain – and what each is specifically designed for. Dental veneers do not require special care. Rather, it is important that you remain committed to good oral hygiene practices, such as brushing and flossing the recommended number of times on a daily basis. (You should brush twice a day, and floss once a day). Although porcelain veneers are stain-resistant, it may be also be best to avoid specific stain-causing foods and beverages. This includes coffee, tea, and red wine. If you are interested in dental veneers, you may also want to learn about the alternative treatments available. Veneers are a great option for individuals who want a dramatic improvement in the shape and color of their teeth. Bonding and crowns are available, but offer more subtle changes.